Zollinger-Ellison syndrome is caused by non-beta islet cell gastrin-secreting tumors of the pancreas. These tumors stimulate acid-secreting cells of the stomach to maximal activity, with consequent gastrointestinal (GI) mucosal ulceration. [1, 2, 3, 4, 5] CT scans of Zollinger-Ellison syndrome are depicted in the images below. CT scan of the abdomen with contrast enhancement, arterial-phase image. Note the brightly enhancing mass in the wall of the duodenum medially (arrow). Courtesy of J. Kevin Smith, MD, PhD. CT scan of the abdomen with contrast enhancement, portal venous phase image. Note the significantly decreased enhancement of the mass in the wall of the duodenum medially. Courtesy of J. Kevin Smith, MD, PhD. In 1955, Zollinger and Ellison first described the classic triad of fulminating peptic ulcer disease, gastric acid hypersecretion, and non-beta islet cell tumors. The diagnosis of Zollinger-Ellison syndrome is made based on a combination of criteria, including the clinical presentation, gastrin radioimmunoassay findings, gastric acid secretory testing, and diagnostic imaging evaluation. Imaging tests play an important role in evaluating the extent of the tumor and in directing therapy. In addition, imaging is important for monitoring patients following surgical resection of the tumors. Zollinger-Ellison syndrome can be either sporadic, developing on its own, or familial, secondary to the genetic disorder multiple endocrine neoplasia type 1 (MEN 1) syndrome. MEN 1 syndrome is a condition that includes parathyroid, pancreatic, and pituitary tumors. Imaging studies are essential for planning an appropriate strategy for the treatment of patients with Zollinger-Ellison syndrome. First and foremost, imaging studies determine tumor extent. The presence of diffuse metastatic disease is a contraindication for surgical resection. In addition, identification of the primary site of the tumor helps in planning the surgical procedure. 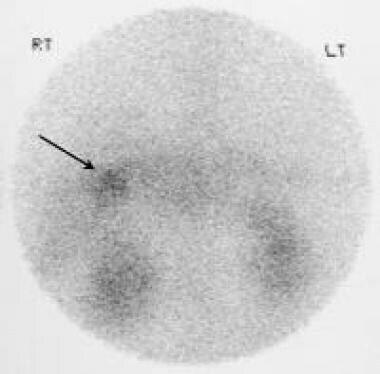 After appropriate biochemical diagnosis of Zollinger-Ellison syndrome, the initial imaging of choice is somatostatin-receptor scintigraphy (SRS); however, this technique is not commonly available. [7, 8, 9] Computed tomography (CT) scans of the abdomen can be performed first. Ultrasonography or magnetic resonance imaging (MRI) of the abdomen can also be performed if CT scans demonstrate negative findings. Once Zollinger-Ellison syndrome has been biochemically proven, an SRS should be performed. Endoscopic ultrasound may be useful if other imaging studies have failed to detect a lesion. Sonography, MRI, and CT scans are all limited by low sensitivity; small primary lesions can be easily missed by these imaging tests. Somatostatin-receptor scintigraphy (SRS) is only available in major medical centers. Plain abdominal images are not useful in the routine evaluation of patients with Zollinger-Ellison syndrome. However, in patients presenting with complications stemming from Zollinger-Ellison syndrome, evidence of abdominal visceral perforation can be seen. Evidence of gastric outlet obstruction may also be seen. Upper GI series findings may reveal esophageal stricture, duodenal ulcers, duodenal strictures, and hypertrophic gastric and duodenal folds. The presence of hypertrophic gastric folds on plain radiographs has a sensitivity of 94% for Zollinger-Ellison syndrome. On nonenhanced CT scans, a small hypoattenuating nodule may be seen in the duodenum or pancreas. Gastrinomas may occasionally be calcified. They are usually transiently hyperattenuating during arterial phase contrast-enhanced CT scans. Liver metastases may be seen; these are usually hypervascular and are best seen on arterial phase scanning. For contrast-enhanced CTs of Zollinger-Ellison syndrome, see the images below. Lower-level arterial-phase, contrast-enhanced CT scan of the abdomen. Note the 2 additional small, brightly enhancing masses in the wall of the duodenum, in the posterior aspect (arrows). Courtesy of J. Kevin Smith, MD, PhD. Portal venous phase, contrast-enhanced CT scan of the abdomen. Note that there is less enhancement of the 2 additional small, brightly enhancing masses in the wall of the duodenum. Courtesy of J. Kevin Smith, MD, PhD. CT scans help to detect 38-75% (with a mean of 50%) of extrahepatic gastrinomas, while 42-76% of hepatic metastasis are seen on CT scans. The detection rate is higher for gastrinomas located in the pancreas or for larger tumor sizes (30% for 1- to 3-cm tumors compared to greater than 95% for tumors larger than 3 cm). CT scans have a specificity of 95%, a positive predictive value of 96%, and a negative predictive value of 54%. For gastrinomas that have metastasized to the liver, CT scans of the abdomen have a sensitivity of 54%, a specificity of 98%, a positive predictive value of 96%, and a negative predictive value of 54%. Smaller tumors are frequently missed on CT scans. Useful sequences are fat-saturated T1- and T2-weighted sequences, as well as dynamic gadolinium-enhanced sequences (see images below). Late arterial, gadolinium-enhanced, T1-weighted MRIs through the pancreas shows a hypointense nonenhancing mass on the superior border of the tail of the pancreas (arrows). The liver appeared normal on the rest of the MRIs. Courtesy of Ali Nawaz Khan, MBBS. Portal venous-phase, gadolinium-enhanced, T1-weighted MRI through the pancreas shows a hypointense, nonenhancing mass on the superior border of the tail of the pancreas (arrows). The liver appeared normal on the images obtained with the rest of the MRI sequences. Courtesy of Ali Nawaz Khan, MBBS. The primary tumor is usually hypointense on T1-weighted images and hyperintense on T2-weighted images, and they typically show early arterial enhancement. Ring enhancement may be present, and the tumors are occasionally hypovascular and show no enhancement. Lesions may be seen in the duodenal wall, pancreas, liver, or bones. Gadolinium-based contrast agents (gadopentetate dimeglumine [Magnevist], gadobenate dimeglumine [MultiHance], gadodiamide [Omniscan], gadoversetamide [OptiMARK], gadoteridol [ProHance]) have been linked to the development of nephrogenic systemic fibrosis (NSF) or nephrogenic fibrosing dermopathy (NFD). The disease has occurred in patients with moderate to end-stage renal disease after being given a gadolinium-based contrast agent to enhance MRI or MRA scans. Worldwide, over 200 cases have been reported, according to the FDA. NSF/NFD is a debilitating and sometimes fatal disease. Characteristics include red or dark patches on the skin; burning, itching, swelling, hardening, and tightening of the skin; yellow spots on the whites of the eyes; joint stiffness with trouble moving or straightening the arms, hands, legs, or feet; pain deep in the hip bones or ribs; and muscle weakness. For extrahepatic primary gastrinomas, MRI has a sensitivity of 20-25%, a specificity of 100%, a positive predictive value of 100%, and a negative predictive value of 11%. For metastatic gastrinoma to the liver, MRI has a sensitivity of 43%, a specificity of 100%, a positive predictive value of 100%, and a negative predictive value of 81%. MRI is highly sensitive for bone metastases. Primary tumors located in the duodenum or pancreas are frequently missed on MRI. The primary tumor may be seen as a hypoechoic nodule in the head of the pancreas, in the duodenum, or in adjacent structures. Occasionally, the primary tumor is hyperechoic. Hyperechoic or isoechoic metastases with a hypoechoic halo may also be seen. Ultrasonograms of Zollinger-Ellison syndrome are depicted in the images below. Axial sonogram through the pancreas shows a bulbous tail of the pancreas with a small focus of calcification. Courtesy of Ali Nawaz Khan, MBBS. Sagittal sonogram through the liver shows a heterogeneous echo pattern suggestive of diffuse metastases. Courtesy of Ali Nawaz Khan, MBBS. Endoscopic ultrasonography is more sensitive than transabdominal ultrasonography, and high sensitivities have been reported for pancreatic gastrinoma detection (>90%). It is less sensitive for duodenal gastrinoma detection; however, endoscopic ultrasonography is not widely available and requires considerable expertise in order to localize these small tumors. Lesions seen on ultrasonograms must be confirmed via another imaging study, especially if lesions are seen in the liver. Tumor size and location are critical to the ultrasonographic detection rate. Overall, ultrasonography has a poor sensitivity for extrahepatic lesions (23%); however, sensitivity increases for larger tumor sizes and tumors confined to the pancreas. 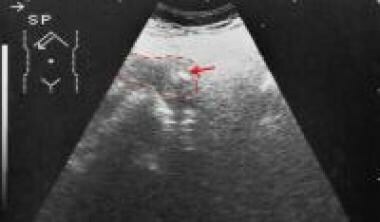 The positive predictive value of ultrasonography for extrahepatic gastrinoma is 92%, and the negative predictive value is 25%. For hepatic lesions, the sensitivity is higher (76%). Lesions missed on CT scans or angiograms can be detected by using ultrasonograms; therefore, ultrasonography has a role in the initial workup of patients with gastrinoma. For the detection of hepatic metastases, ultrasonography has sensitivity comparable to that of CT scanning (≤63%), with a specificity of 100%, a positive predictive value of 100%, and a negative predictive value to 89%. Hepatic hemangiomas may be mistaken for liver metastases. Somatostatin-receptor scintigraphy (SRS) is the study of choice for the initial evaluation of patients with Zollinger-Ellison syndrome. (See the images below). Octreotide scan of the abdomen. Note the 2 small areas of increased activity in the right upper abdomen corresponding to the 2 small, adjacent masses between the duodenal wall and the head of the pancreas (arrows). Courtesy of J. Kevin Smith, MD, PhD. Indium-labeled octreotide scan shows radionuclide uptake in the region of the tail of the pancreas. 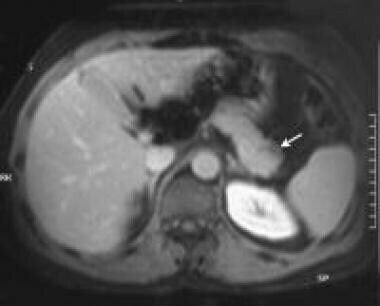 Also shown is a metastatic liver deposit (arrow), which was not detected on a CT scan performed 10 days earlier or on an MRI done 72 hours earlier. Courtesy of Ali Nawaz Khan, MBBS. 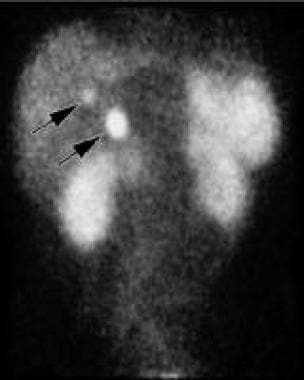 Indium-labeled octreotide scan shows radionuclide uptake in a metastatic liver deposit. Courtesy of Ali Nawaz Khan, MBBS. SRS has a higher sensitivity (58-77%; mean, 67%) than do conventional imaging studies (CT, ultrasonography, MRI) for extrahepatic gastrinomas, and a specificity equal to all of these studies combined (SRS specificity, 84-94%). For hepatic metastases, the sensitivity is 92-100%. The sensitivity for localizing duodenal gastrinoma is lower than that for localizing pancreatic gastrinoma. False-positive findings have been reported to occur in granulomatous disease (sarcoid, Wegner disease, tuberculosis), thyroid diseases (Graves disease, thyroiditis), various forms of arthritis, lymphomas (Hodgkin lymphoma, non-Hodgkin lymphoma), and activated lymphocytes secondary to infections. Angiography can be a useful tool in localizing neuroendocrine tumors (see the images below). 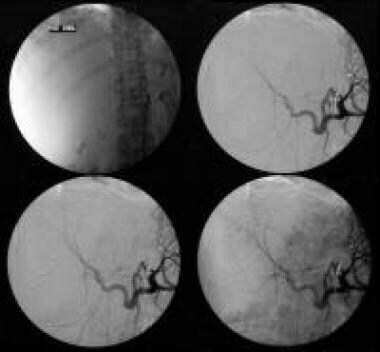 Celiac-axis angiography shows shutdown of the tumor circulation following embolization of the liver with polyvinyl alcohol particles (250-400 mm). Courtesy of Ali Nawaz Khan, MBBS. Celiac-axis angiography (arterial phase) of a patient with hypervascular liver metastases. The patient had a previously resected pancreatic gastrinoma. Courtesy of Ali Nawaz Khan, MBBS. Celiac-axis angiography (venous phase) of a patient with hypervascular liver metastases. The patient had a previously resected pancreatic gastrinoma. Courtesy of Ali Nawaz Khan, MBBS. Most gastrinomas are hypervascular, and the reported sensitivity of arteriography is 60-100%; however, small hypovascular tumors may be missed. Hepatic venous sampling after intra-arterial secretin stimulation can also be used; this modality has a sensitivity of 77%. Ellison EC, Johnson JA. The Zollinger-Ellison syndrome: a comprehensive review of historical, scientific, and clinical considerations. Curr Probl Surg. 2009 Jan. 46(1):13-106. [Medline]. Ellison EC. Zollinger-Ellison syndrome: a personal perspective. Am Surg. 2008 Jul. 74(7):563-71. [Medline]. Jani N, Moser AJ, Khalid A. Pancreatic endocrine tumors. Gastroenterol Clin North Am. 2007 Jun. 36(2):431-9, x-xi. [Medline]. Epelboym I, Mazeh H. Zollinger-Ellison syndrome: classical considerations and current controversies. Oncologist. 2014 Jan. 19 (1):44-50. [Medline]. Krampitz GW, Norton JA. Current management of the Zollinger-Ellison syndrome. Adv Surg. 2013. 47:59-79. [Medline]. Zollinger RM, Ellison EH. Primary peptic ulcerations of the jejunum associated with islet cell tumors of the pancreas. Ann Surg. 1955 Oct. 142(4):709-23; discussion, 724-8. [Medline]. Gibril F, Reynolds JC, Lubensky IA, Roy PK, Peghini PL, Doppman JL, et al. Ability of somatostatin receptor scintigraphy to identify patients with gastric carcinoids: a prospective study. J Nucl Med. 2000 Oct. 41(10):1646-56. [Medline]. Jensen RT, Gibril F. Somatostatin receptor scintigraphy in gastrinomas. Ital J Gastroenterol Hepatol. 1999 Oct. 31 Suppl 2:S179-85. [Medline]. Termanini B, Gibril F, Reynolds JC, Doppman JL, Chen CC, Stewart CA, et al. Value of somatostatin receptor scintigraphy: a prospective study in gastrinoma of its effect on clinical management. Gastroenterology. 1997 Feb. 112(2):335-47. [Medline]. 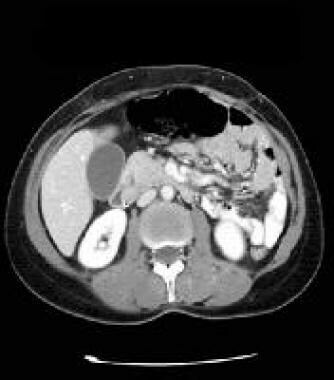 CT scan of the abdomen with contrast enhancement in a patient with gastrinoma. Note the marked thickening of the proximal gastric folds (arrows). Courtesy of J. Kevin Smith, MD, PhD. 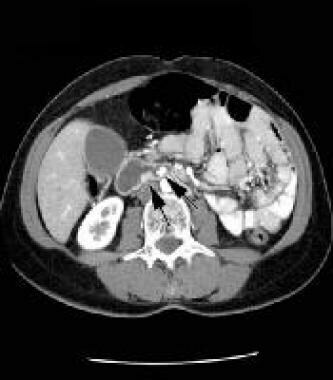 Contrast-enhanced CT scan of the abdomen in a patient with gastrinoma. Note the relative lack of thickening of the gastric antrum. Courtesy of J. Kevin Smith, MD, PhD. 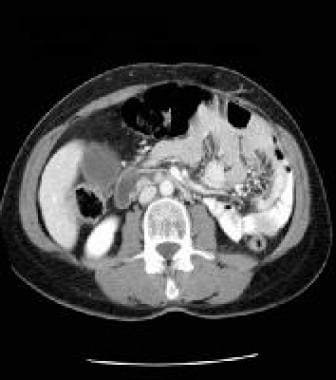 Contrast-enhanced CT scan of the abdomen in a patient with gastrinoma. Note the small, enhancing mass between the wall of the duodenum and the head of the pancreas (arrow). Courtesy of J. Kevin Smith, MD, PhD. Lower-level contrast-enhanced CT scan of the abdomen. Note the small, enhancing mass between the wall of the duodenum and the head of the pancreas. Courtesy of J. Kevin Smith, MD, PhD. Axial late portal venous phase CT scan through the pancreas shows a hypoattenuating mass with minimal ring enhancement in the region of the tail of the pancreas (arrow). This patient had a duodenal gastrinoma resected 2 years previously and presented with recurrent symptoms. The liver appeared normal on the rest of the CT cuts. Courtesy of Ali Nawaz Khan, MBBS. Double-contrast study obtained with a barium meal shows prominent gastric rugae and thickened mucosal folds in the duodenum and jejunum. Courtesy of Ali Nawaz Khan, MBBS. Late portal venous phase axial CT scan through the liver shows several liver lesions suggestive of metastases. Courtesy of Ali Nawaz Khan, MBBS. 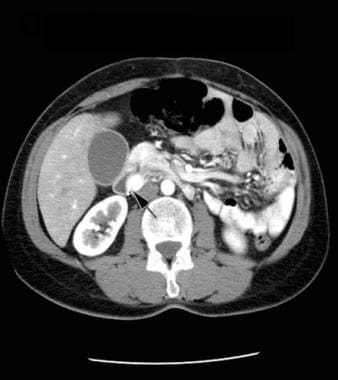 Late portal venous phase axial CT scan through the liver and pancreas shows several liver metastases and a bulbous tail of the pancreas with a small focus of calcification. Courtesy of Ali Nawaz Khan, MBBS. 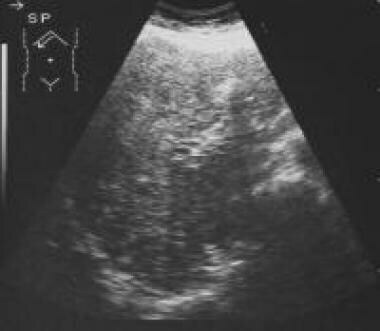 Sagittal sonograms through the liver of a patient presenting with hepatomegaly and diarrhea. Note the patchy echo pattern. The patient, a 39-year-old woman, had previously undergone pancreatic surgery for a gastrinoma. Courtesy of Ali Nawaz Khan, MBBS. Arterial-phase, contrast-enhanced axial CT scans shows gross hepatomegaly and numerous liver metastases. Courtesy of Ali Nawaz Khan, MBBS. Celiac-axis angiography shows hypervascular liver metastases. Courtesy of Ali Nawaz Khan, MBBS. Axial sonogram shows a fatty liver with a hypoechoic central mass in a patient with a gastrinoma who underwent surgery. Courtesy of Ali Nawaz Khan, MBBS. 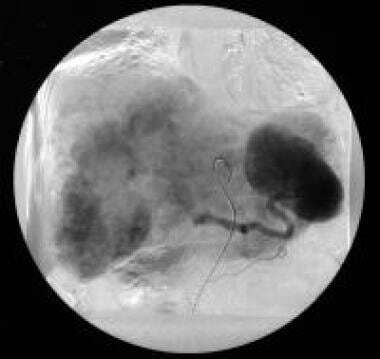 Celiac-axis angiogram obtained after embolization shows shutdown of the tumor circulation. Courtesy of Ali Nawaz Khan, MBBS. A double-contrast barium meal shows gastric and duodenal ulcers. Courtesy of Ali Nawaz Khan, MBBS. Coned views of the duodenal cap show a pyloric canal ulcer. Courtesy of Ali Nawaz Khan, MBBS. A study obtained with a small-bowel meal shows thickened mucosal folds. Courtesy of Ali Nawaz Khan, MBBS. CT scan through the pancreas shows a small, hypoattenuating area in the head of the pancreas. It was initially interpreted as the common bile duct but was subsequently proved to be a gastrinoma. Courtesy of Ali Nawaz Khan, MBBS. Superselective pancreatic angiogram shows 2 hypervascular tumors (arrows): 1 in the head and the other in the tail of the pancreas. The tail tumor shows central necrosis. Courtesy of Ali Nawaz Khan, MBBS. Fast Five Quiz: Do You Know the Risk Factors, Diagnostic Tests, and Treatment for Pancreatic Cancer? PARP Inhibitors for Maintenance Therapy in Pancreatic Cancer?